You have less control over your search engine optimization when you promote your business or service through a low-cost or free website. Your unique earrings or hand puppets will have a difficult time being found through a web service that promotes hundreds of similar products. Have you read the terms and conditions thoroughly? The devil is in the details. Free frequently only refers to the design. You still pay for hosting and the domain, yet you don’t own the domain. Does the free or low cost website requires you to purchase hosting for multiple years? You can’t take your design with you if you change hosts. Do you or does the company own your domain or your content? Of the majors providers we listed, they all own your content. Ditto for Wix and Weebly. Do they back up your website regularly? Do you get a copy of this backup? Is your hosting on a secure server? If someone on your server misbehaves, everyone on the server is blacklisted by Google, Bing &/or Yahoo. These free services use shared hosting. Are you allowed to customize your website to fit your brand? Do you have a custom mobile interface? Odds are, you don’t. Does your site work on multiple devices? In 2014 over 1.2 Billion (yes, with a “B”) accessed the internet with a smartphone. How about multiple browers? What can you do if they don’t? The answer: Nothing. It’s their design. What if the company hosting your site it bought, sold or dissolves? Can you make your site an E-Commerce site to sell online? If so, which is unlikely, can you decide what payment portals to use? How much choice do you have when choosing social media buttons or feeds? Do the buttons go directly to your site? Can you get an e-mail address with your domain? Does it work? Can you filter spam or use it with your e-mail client (Outlook, Thunderbird, GMail, etc.)? This is why paying for quality web services is invaluable. It allows you to truly “own” your product, service and idea. You can promote yourself and not also advertise other companies in the process. You can use plug in tools to measure analytics to understand your websites visitors. 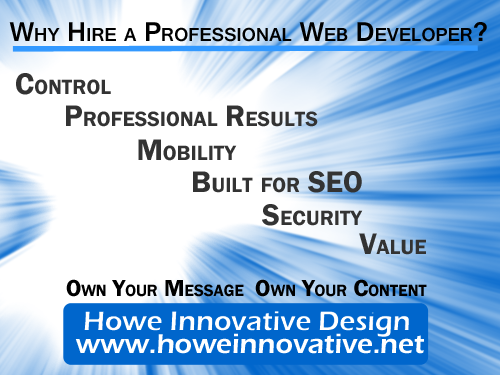 You have more control over the speed and security of your website and can receive technical support. It’s your message. You should own it.